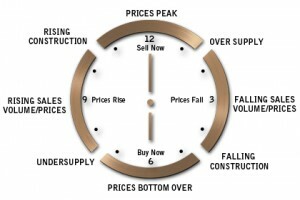 One of the major drivers or a successful property investment is market timing. Combine this with a long-term property strategy and you will be set to achieve your investment dreams. Here is our five-step plan to deciphering and profiting from the property cycle. History tells us that a cycle generally lasts for about seven years, with 3 – 3.5 years of a slowdown and a flattening out of house prices, followed by 3.5 years of rising prices and so on and so on. However, keep in mind that each market also operates inside its own dynamics, which can dictate the rise and peak of the cycle and its severity. The most obvious factor is interest rates. Low interest rates indicate that it could be an opportune time to buy. When rates start to rise the market moves into the next phase with more demand, leading to sharp rises in prices. Migration and economic data is another key trigger. If the growth and economic indicators are trending upward, then this is the sign of a growth phase. Remember that when considering an investment make sure to look outside your area and those emerging hotspots showing good capital growth and strong rental returns. At the macro level Australia is enjoying a period of strong economic stability with low unemployment. On top of this interest rates are low indicating the end of the property slowdown and the start of an upswing in the medium term. Economists are now forecasting an interest rate increase later in 2013. Also consider the specific market you are looking at buying into. Look at its future growth and the proposed and current infrastructure projects planned. If employment, growth and economic data is up this will mean that the region is in a growth stage and well positioned for investment. There is one proviso to all of this cycle talk and that’s ensuring the right asset selection. Picking the right time in the property cycle will not mean much unless you buy a property based on sound fundamentals in the first place. A good property is a long-term asset and will always increase in value in the long term. We suggest looking at solid markets, where demand is strong and therefore land values are increasing and rental demand is high.